The number of stock accounts in China has likely exceeded 100 million for the first time, as investors are lured to a market which has jumped 60 percent so far this year, the Shanghai Securities News said on Tuesday. Investors in China had opened nearly 27 million accounts to trade stocks since the end of 2006, the paper reported, citing data and calculations from China Securities Depository and Clearing Corporation Ltd. The calculation of the new record was based on the assumption that the number of accounts opened on Monday was in line with last week's daily average of 350,000 added to a total 99.82 million accounts as of May 25, it said. The figure included both accounts for yuan-denominated A shares, foreign currency-denominated B-share accounts and funds, and did not correspond to the total number of new investors, the report cautioned. 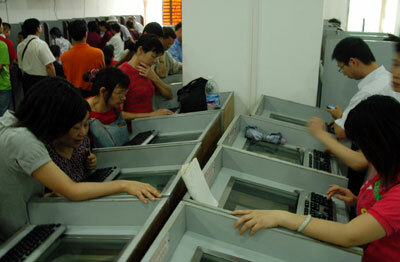 An investor in China's stock market may hold up to six accounts simultaneously, it said.